Mountains, by their very nature, can be difficult to climb and, as any mountaineer will tell you, acesending a mountain takes patience, resilience and the ability to work well as a strong small team, especially when you can’t see the summit. empower a hundred more HIV + women in Tanzania so they can start and grow small business. Thank you for being part of this small group of individual and corporate funding partners. As Margaret Mead famously said, “Never doubt that a small group of thoughtful, committed, citizens can change the world. Indeed, it is the only thing that ever has“. Currently our team of individual supporters numbers 51; these are people at base camp who give to Mondo through monthly donations. Last year the income from these people (including Gift Aid) was just over £40,000. As we start 2019 we need to increase our core income and increase the number of people supporting Mondo. This is what we need to climb the next mountain. We are therefore asking all ex-volunteers, friends and family members to consider standing with us through making a regular donation of £10- £30 a month. If you already give would you be willing to increase your Standing Order? 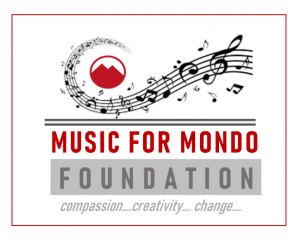 You can download a short form here or just drop us an email at info@mondofoundation.org. – Michael Dennison, retired former Head Teacher and Ofsted inspector who volunteered in Nepal and India. 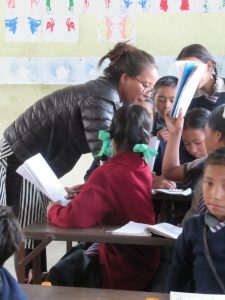 Through the generosity of two Grant Making Trusts, Mondo has able to fund 10 Nepali teachers to work in some of our poorest schools up to 2020. As well as providing this funding we are supporting them in identifying their training needs and have sent volunteers (including 40 students from Cambridge and Durham Universities) to work in their schools. Joyti Adhikari is one of the teachers we support. Working at Taltulesowry school, Joyti is passionate about her teaching and combines her artistic skills withher child-centred interactive approach through which she tries to develop her students’ creativity and problem-solving skils. Another of our volunteers is experienced teacher Mark Adams who is working for 9 months in Mondo schools in Kalimpong, running training across the schools in interactive teaching methods and lesson planning. 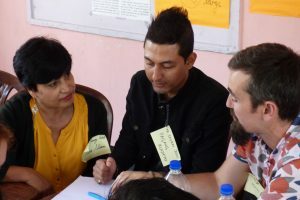 Mark – who has worked previously in Mongolia and the UK – has been welcomed by teachers and has run training to all the head teachers but also in individual schools. He writes: “The experience is all encompassing. It intoxicates the senses. I am travelling the most incredibly interesting and rewarding road. Training teachers to understand how to engage children in a more interactive way is imperative to help them develop teaching styles that better support the way in which children learn and assimilate information. Many teachers can see the possibilities and now need support and encouragement to develop their skills in thinking creatively.” You can read Mark’s fuller blog on child-centred education HERE. Finally, we want to give all our current supporters news of a very special evening we are holiding on Saturday 16 February in Central London called ‘Music for Mondo’. Held in the intimate surroundings of St Michael’s Chester Square, this unique evening brings together world-class classical musicians to perform to support our work. We are restricted tickets to just 80 guests and the event will provide both supporters, and new friends of Mondo the chance to celebrate the work which the charity has been pioneering in Nepal, Tanzania and NE India for well over a decade. We very much hope friends from near and far will join us for what promises to be an amazing high-quality event.